Frisco City Council has officially approved a new outdoor Commercial Amusement Facility to be named FRISCO MUSIC CITY. The nearly-7 acre site will be located on the northeast side of the Dallas North Tollway and McCandless Way. A culmination of 3 years of planning, Frisco Music City has been described as nothing Frisco has ever seen – a destination spanning interests for every age group and demographic. Hodges commended the City staff for their cooperation on all aspects of the project. 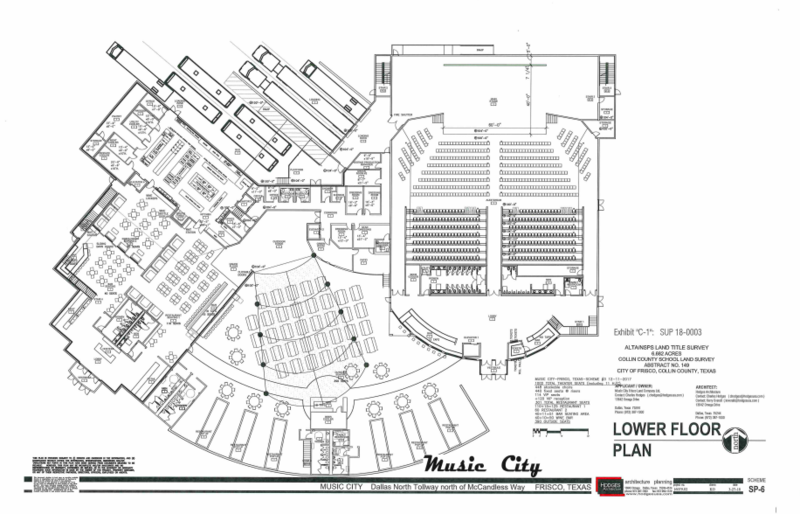 What can we expect from the new entertainment venue? The facility will host concerts, movies, wine festivals and theater productions. The restaurant is described as having “two different personalities” and combined will have a seating capacity of 300. A more formal side will offer an upscale premium steak and protein menu. A secluded wine room connected by a walkway over the stage to the VIP area of the indoor concert and theater venue. The second section will be located close to the outdoor area offering a causal family menu. The venue has been designed for all kinds of events including concerts, movies and wine festivals with flexible seating arrangements. Infinitely adaptable for film festivals to show 3 different movies simultaneously. Spacious enough to support wine and cheese festivals with an excellent space for vendor booths. 6 guest kitchens in the outdoor area to entertain an assortment of guest chefs. There’s a different set of requirements for a music venue than for a performing arts center, I think we have a need for this in our city. We all know the difference between fine arts and live entertainment. While there’s a desire for both, stakeholders acknowledge that a fine arts performance facility requires different accommodations for visual arts displays, etc. Just as there are multiple venues for a variety of sports in Frisco, the symphony, ballet, theater, and visual arts should be housed in a dedicated fine arts space. We look forward to seeing that type of space come to life in Frisco, also, to enhance and build upon the Frisco Music City project,” said Tammy Meinershagen, Executive Director of Frisco Arts. Frisco Music City will provide a new, unique venue to feature our local bands, musicians, and regional talent for the entire family to enjoy in a casual setting. The project is expected to break ground this year.